A Different Perspective On PricingEliminate The Muda! While my wife was on a routine shopping mission, I became diverted with the thought of relative cost per gallon of products. This chart represents what I discovered poking around the store. A number of items are not our usual brands. Some items we have purchased in the past but will no longer as a result of this little excercise. Damn, I really liked that Magic Shell! Oh, we are also now in the market for a new printer! Any suggestions? 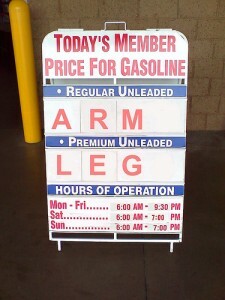 Suddenly, gasoline looks like a pretty good deal. How is it that they can drill it out of the ground ship it around the world put it through a complex cooking process and sell it so cheaply while water can cost $6.00 a gallon and printer ink $4,000? Please comment if this list has any impact on you! Will your spending habits change as a result? I agree on both but especially printer ink! We were just complaining about that at work. A friend bought a new printer a short while ago, and needed to get a new ink cartridge. It turned out costing more than what he paid for the printer… That’s like buying a car, and each time you fill it up, the gas cost more than the original price of the car itself. During our conversations about the ink cartridge, another guy said that they have software that actually guesses how much ink is left, so if it guesses incorrectly, you might still have ink in the cartridge, but it won’t work unless it’s reset. He said there is a way to reset the counter on certain models, but I’m not sure how to. .-= [email protected]´s last blog ..Can You Really Trust People Asking for Handouts When They Are Dressed Better Than You? =-. @ Money Reasons – It really is kind of sickening when you think about some of these prices! Frugal Printing, Is It Possible? « Eliminate The Muda!